Studio headphones are generally used by audio and sound engineers and play a critical role in the production, recording, and mixing processes. These gadgets will allow the user to review his or her mixes in isolation. Studio headphones also assist musicians, sound engineers, and producers who are always on the road most of the time. You cannot use a set of low quality headphones or your iPhone earbuds to evaluate the quality of your recordings or mixes. To be honest, such gadgets will offer a false and unrealistic version of how your record sounds. You need an excellent set of headphones that will present your mixes with a lot of precision. The first elements to put into consideration are the ohm and watt ratings. These two elements define the ‘power’ of any audio device. 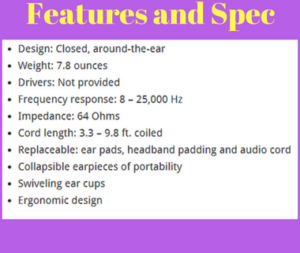 These interdependent specifications determine the ability of any electronic device to release audio signals at varied levels over a particular period. The ohm rating of the device basically describes its impedance. It determines the amount of power the device will require to operate efficiently. As a sound engineer, you must understand that studio headphones that have high ohm ratings will require more power. The good thing is that they will give you access to more natural, high-quality, and accurate sounding signals than using devices that have lower impedance. Any headphones whose impedance is more than 150ohms may require the sound engineer to use a headphone amplifier. You can find these amplifiers in high quality sound interfaces. The advantage is that they add more sound quality and accuracy to your productions and mixes. 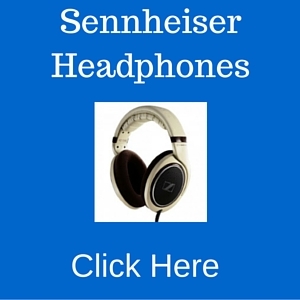 This article presents a review of top five headphones for audio and sound engineers. These include the Audio-Technica ATH-M50x, Sennheiser HD-280 Pro, Sony MDR7506, AKG K 240 MK 11, and Shure SRH840. You need to put all these factors into consideration while choosing the best studio headphones for use. These studio headphones have a closed around the ear design and weigh close to 7.8 ounces. The drivers are not provided in this package and have a frequency response of about 8HZ to 2500HZ. 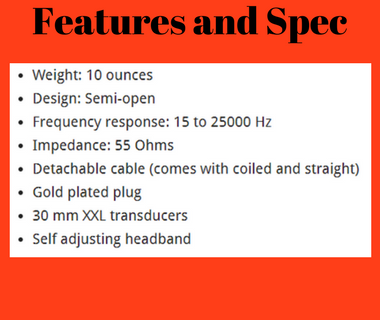 The impedance of the Shure SRH840 is 64 Ohms and the device has a cord length of 3.3 to 9.8 feet coiled. It also has replaceable audio cord, headband padding and war pads. 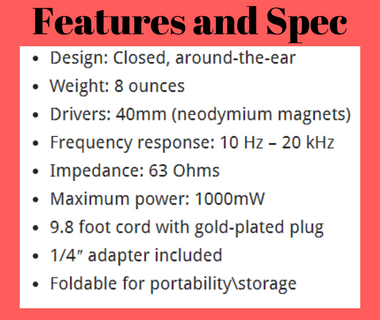 The ear pieces are collapsible to enhance portability, has swiveling earcups and an ergonomic design. Most audio designers love this model because it is lightweight and hence comfortable for use over expended periods. Sennheiser HD-280 Pro presents a very durable set of studio headphones that can last for several years. It is worth investing in these headphones as they can last you more than six years. The around the ear design makes it an ideal option for sound isolation and recording. The set delivers a very clean sound signal with a pretty base that is precise and you will not detect any hissing in your highs. The headphones have a passive noise attenuation that makes them fit tight. This feature helps to block external noise from getting into your ears. 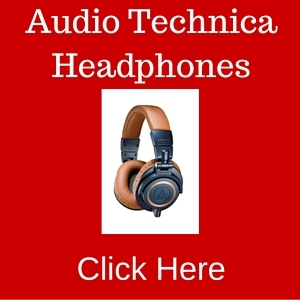 The Audio-Technica headphones have been one of the leading brands in the market for some time now. One of the most popular models you will find out there is the original Audio Technica ATH-M50x. This version of studio headphones comes with an exchangeable cable to give the user some options of connecting the device. The model also comes with a 90 degrees rotating ear cups to enhance its portability and mixing. This set is the best option if you are running a low-budget studio at home. Including the interchangeable cable is one of the greatest updates in this device. It comes with three detachable cables that comprise of 1.2 m to 3 m coiled cable, a short 1.2 m straight cable and a 3.0 m cable. You will love the versatility that this feature brings your way. You can be able to use these studio headphones for different uses depending on the need at a particular moment. The only challenge is that you cannot use the old series of detachable cables from the other headphone brands as its plugs are only compatible with Audio-Technica cables. The ATH-M50x is as technologically sound and stable as its predecessor M50. The headphones are also very comfortable and you can put them on for a long time without feeling the effect. Individuals with big heads have a reason to smile because these overhead earphones are a bit wider. Another attribute you will love with these headphones is that color options that comes with it. Apart from black, you can also get the blue and white versions. Given that the earcups can rotate at 90 degrees, it makes these headphones travel friendly and more compact. The set also comes with a travelling pouch to make it more compact. You can also detach the cables given that they are interchangeable so that you don’t roll them round the headphones. This will protect the cables from breaking or tangles which enhances their durability in the long run. The frequency range of these headphones is 15 to 2800 HZ. It has a sensitivity of 99 dB with a total weight of 258 grams or 10 ounces excluding the cables. The maximum input power of these studio headphones is at 1Khz or 100mH and the set has a dynamic closed back. The drivers have a diameter of 45mm and is an ideal option for audio and sound engineers. This set presents another ideal option for studio headphones in the music industry. You will agree to the fact that Sony electronics presents some of the most affordable devices in the market. . The set has a closed around the ear design and weighs close to 8 ounces. The model has 40mm neodymium magnet drivers and a frequency response of 10Hz to 20Hz. The impedance of these Studio headphones is 63ohms and that have a maximum power of 100mW. The model comes with a code that is 9.8-foot-long and a plug that is gold plated. The package also comes with a quarter inch adapter and you can fold it for easy storage and portability. The 40mm drivers and neodymium magnets deliver a detailed and powerful sound. The closed-ear design brings about an outstanding reduction of noise from the environment and also provides comfort. The large headphone diaphragm has a rugged construction that make is secure for everyday use. One attribute that you will discover with these studio headphones is that their impedance tends to be higher than some models that will cost you more money. Sony MDR750 is not only comfortable but also comes with an accurate sound that has very nice lows, crisp highs, and decent Mids. 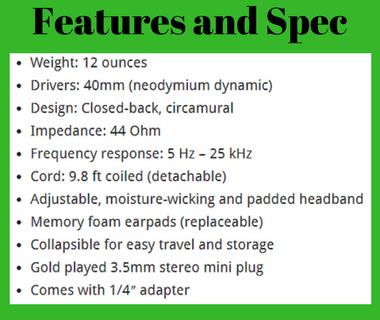 These characteristics render it as an all-around accurate studio headphone. You can use it for recording everyday as it has a closed design, and a comfortable headband and pads. The package also comes with a soft travelling case but it is wise to buy a hard shell to offer maximum protection to your gadget just in case you wish to travel. Shure studio headphones are one of the top competitors in the music industry. The SRH 840 weights close to 12 ounces and has 40mm neodymium dynamic drivers. These headphones have a circumoral closed-back design with an impedance of 44 Ohm. The frequency response of this gadget is 5 Hz to 25 KHz and has a 9.8 detachable feet cord. The headband is not only padded but also adjustable and moisture wicking. It has replaceable memory foam earpads and you can collapse it for easy storage and travel. The headphones have a 3.5mm gold played stereo mini plug and comes with a quarter inch adapter. One feature that makes this model to stand out from the market is its impedance and standard drivers. Most audio engineers love these monitoring headphones because they have a clear treble and deep bass that give a good balance. You can be sure of getting an accurate and clean sound with these headphones. Shure SRH 840 has one of the best reviews among other studio headphones out there. The model has a semi-open design and weighs close to 10 ounces. The frequency response for this device is 15-2500 Hz with an impedance of 55 Ohms. It has a detachable cable that comes both straight and coiled and a gold-plated plug. 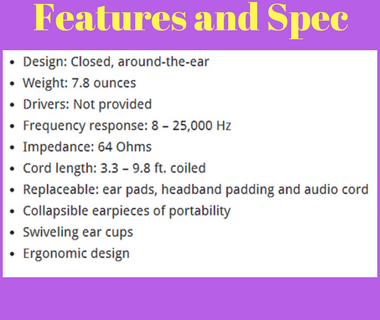 These headphones also have 30 mm XXL transducers and a self-adjusting headband. This brand has a great following in the market place. The headphones allow a small amount of sound to leak but this prevents it from building up. Their ear pads are very comfortable and they provide an ideal option for mixing. The cushions of these headphones are more soft and the set comes with one extra cable. It also produces an all-around sound that is very accurate and flat. There is an excellent match between the treble and base sound and this gives the user the value for his money. AKG K 240 MK 11 is reasonably priced this makes it to be one of the best semi-open studio headphones you can find in the market.